Friday night’s match between Hibs and Rangers at Easter Road was marred by a supporter confronting visiting defender James Tavernier. 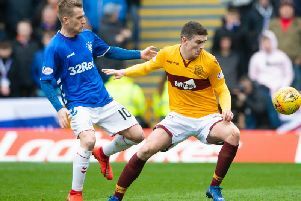 The fan, who came from the home end, jumped on to the park at the end of the first half and made his way towards the Rangers right-back. After kicking the ball away from Tavernier, the supporter then appeared to strike out at the player before being hauled away by police. This is the latest in a long string of incidents involving fan behaviour in Scottish football this season. Celtic winger Scott Sinclair had a buckfast bottle thrown at him during the recent Scottish Cup tie at Easter Road, while Hibs also reported objects being thrown from the away end. Hearts goalkeeper Zdenek Zlamal had coins thrown at him by Celtic fans in the recent league match at Tynecastle. The Czech keeper was also attacked by a Hibs fan earlier in the season - the same match where then Hibs boss Neil Lennon was struck by a coin thrown from the home end.